Tokyo is on my travel wishlist. Japan fascinates me. 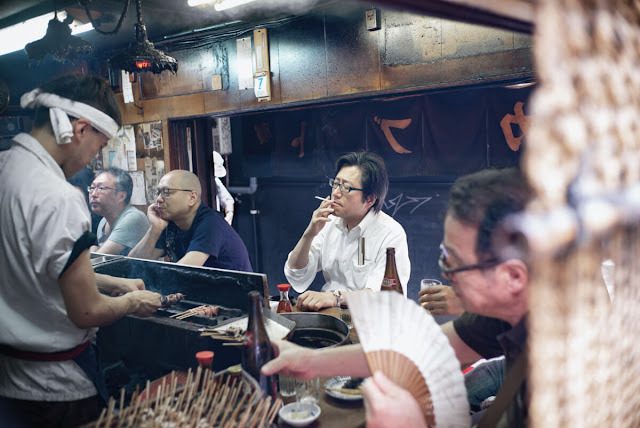 Since my college years, and until recently, I've followed Lee Chapman's Tokyo Times blog, where he shares photos of the every day in one of the world's busiest cities. His collection, The Bar, shows the warmth of human companionship and the familiar feeling of strangeness. I'm in no way endorsing smoking--if you're a smoker, please quit right away, for your sake and your family's--but there's something to this photo that I can relate to. Maybe it's the tired, exhausted, but peaceful feeling of having done a day's job, and the chance to unwind a little before heading home. Sure, Jef! Let's schedule that trip! Haha, as soon as I saw the photo I thought it must stink of smoke there. Thanks for the caveat! And barbecue smoke, which isn't good for the lungs, either.